Okay, climate change is happening. But it has natural causes, and humans have nothing to do with it. Ask the majority of climate scientists: Man-made carbon pollution is the cause of global warming. 97 percent of top climate scientists and every major National Academy of Science agree that man-made pollution is warming our climate. Here’s how they know. First, the concentration of carbon dioxide in the atmosphere has increased about 40 percent since humans started burning dirty energy like coal. Second, the carbon from dirty energy has a unique chemical signature that differentiates it from other sources of carbon — so we can confirm that it's coming from us. Third, we know it is carbon — not natural forces like the sun — that's responsible for the recent increase in global temperatures. Why? The lower level of the atmosphere is warming, while the middle layer is cooling. If the sun were responsible for most of the recent temperature change on Earth, both layers of the atmosphere would be warming. The evidence is inescapable: Humans ARE changing our climate. Before the Industrial Revolution, Earth’s climate changed due to natural causes not related to human activity. Most often, global climate has changed because of variations in sunlight. Tiny wobbles in Earth’s orbit altered when and where sunlight fell on Earth’s surface. Variations in the sun itself have alternately increased and decreased the amount of solar energy reaching Earth. Volcanic eruptions have generated particles that reflect sunlight, brightening the planet and cooling the climate. Volcanic activity has also, in the deep past, increased greenhouse gases over millions of years, contributing to episodes of global warming. These natural causes are still in play today, but their influence is too small or they occur too slowly to explain the rapid warming seen in recent decades (Figure 1). We know this because scientists closely monitor the natural and human activities that influence climate with a fleet of satellites and surface instruments. 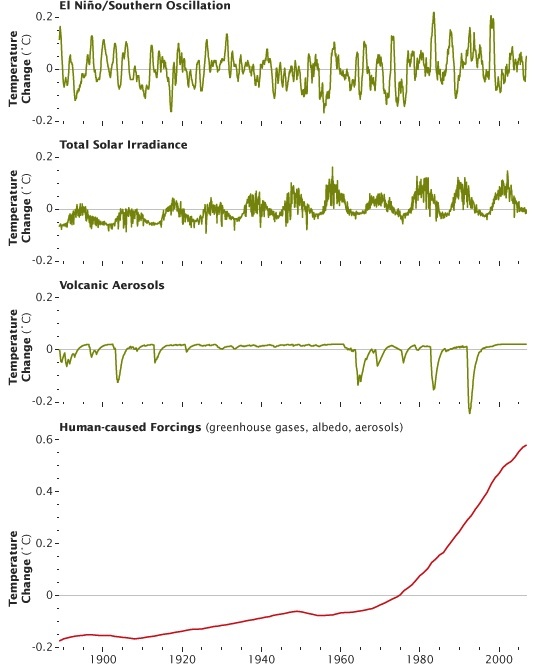 Figure 1: Although Earth’s temperature fluctuates naturally, human influence on climate has eclipsed the magnitude of natural temperature changes over the past 120 years. Natural influences on temperature — El Niño, solar variability, and volcanic aerosols — have varied approximately plus and minus 0.2° C (0.4° F) (averaging to about zero), while human influences have contributed roughly 0.8° C (1° F) of warming since 1889. Source: NASA. Adapted from Judith L. Lean and David H. Rind, Geophysical Research Letters 35 (2008): L18701. NASA satellites record a host of vital signs including atmospheric aerosols (particles from both natural sources such as volcanoes and human sources such as factories); atmospheric gases (including greenhouse gases); energy radiated from Earth’s surface and the sun; ocean surface temperature changes; global sea level; the extent of ice sheets, glaciers and sea ice; plant growth; rainfall; cloud structure and more. On the ground, many agencies and nations support networks of weather and climate-monitoring stations that maintain temperature, rainfall and snow depth records; and buoys that measure surface water and deep ocean temperatures. Taken together, these measurements provide an ever-improving record of both natural events and human activity for the past 150 years. Scientists integrate these measurements into climate models to recreate temperatures recorded over the past 150 years. Climate model simulations that consider only natural solar variability and volcanic aerosols since 1750 — omitting observed increases in greenhouse gases — are able to fit the observations of global temperatures only up until about 1950. After that point, the decadal trend in global surface warming cannot be explained without including the contribution of the greenhouse gases added by humans.